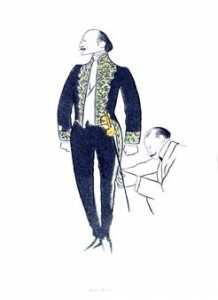 As soon as he leaves university, he publishes in 1896 a first album of drawings of Livorno’s high society in their summer clothing: ‘Lanterna Magica, Estate’. 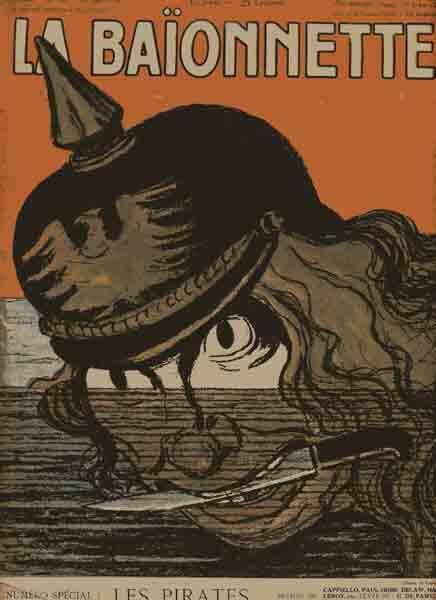 Livorno was a reputable seaside resort at the time and allowed Cappiello to find interesting characters to sketch. His representations of these characters are realistic, without exaggeration or coarseness. His style is stripped: simple lines with a light wash of watercolors. “…. I was pleasantly wasting my time in Livorno, when in 1898 I formed the plan of going to Paris, not to work, but to see my brother who was working at the Stock Exchange. I wanted to spend at least a month with him, enough time to get to know the capital. I went to the Stock Exchange sometimes; I saw interesting faces there which I drew to amuse myself. These caricatures which my brother showed to his friends created great astonishment. They congratulated me and I tasted the joy of this success without even thinking of expanding my circle of experiences, of relations, without any ambition of a more resounding glory. In addition, my father died around about the same time. I went back to Livorno. But Paris had conquered me – even if I hadn’t conquered it yet – and I soon found myself back there strolling along the boulevards. One day I bumped into Puccini. Exclamations of surprise, handshakes (Editor’s note: Puccini was Tuscan like Cappiello and they knew one another well). Arm in arm, we go to the nearest café… It is the aperitif of my future success. I come up with an idea which I expose to Puccini: it would be great to take advantage of his presence in Paris as well as the success ‘La vie de Bohème’ (‘The Bohemian life’) is having there to draw a caricature of him. I would add to it a caricature of Novelli (Editor’s note: Novelli: great actor originating from Tuscany, like Cappiello and Puccini. He was playing in ‘Papa Lebonnard’ by Jean Aicard in Paris at the time). 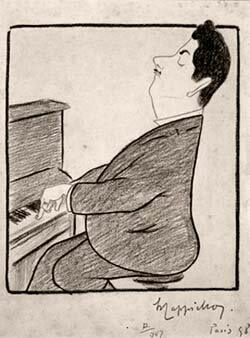 Puccini agrees with me: I get to work and a few days later, I brought both caricatures to ‘Le Rire’. This is my first step towards building my Parisian career. So I dropped off the drawings at the newspaper’s offices without talking to anyone and left. You can imagine my surprise when I saw them printed in the next edition: At the time, I started building hundreds of projects, I was inflamed with such an ardent fire.’ (Interview of Cappiello by Joseph Galtier at the Le Temps newspaper, 4th January 1903). 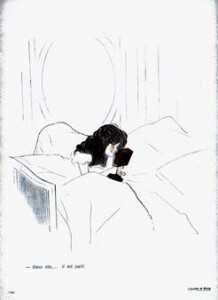 – ’70 Dessins de Cappiello’ (70 Drawings by Cappiello) published in 1905 by H. Floury is his last album. 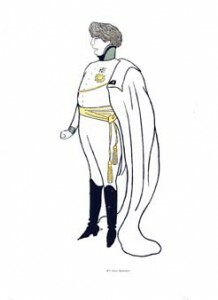 It assembles 70 drawings in black and white with a few highlights of color: Catulle Mendès, Jean Jaurès and Emile Combes at the Assemblée Nationale, Robert de Montesquiou and many others. 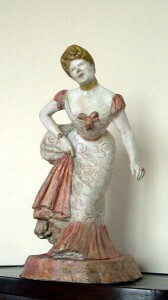 At the same time, in 1899, Cappiello creates polychrome plaster statuettes in the exact same style as his caricatures: Princesse de Ligne, Albert Brasseur, Yvette Guilbert, Jeanne Granier and Réjane. Cappiello’s predecessors made their caricatures using a technique of accentuation, distortion even, of real physical features. We remember the Count of Argout’s nose, Felix Barthe’s squint, Louis Philippe’s pear-shaped head. In the end, readers got tired of it and Cappiello’s new style which was later imitated by Sem but with his own touch, was fully appreciated by the public. 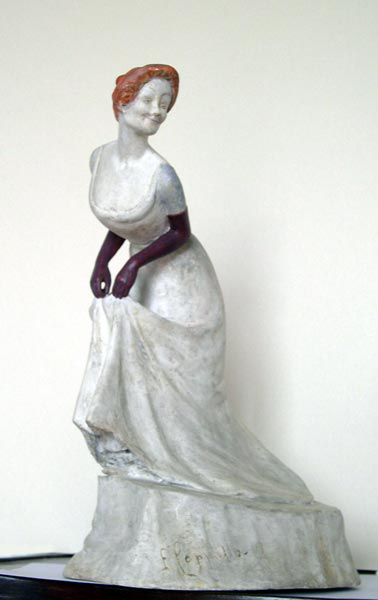 He uses the caricatures of Jeanne Granier and Marthe Mellot as examples and says: ‘I drew the eyes of the first one with a long line which, as sparkling with wit and vivacity as they may be, are in reality rather small; and those of the second one with a dot, which are beautifully big. You see that I have, that way, drawn the look more that the eye in itself and that I didn’t fail by doing so since people do recognize that the drawings look very much like their effigies. As an observer, Cappiello authorized himself to make social comments. As an Italian emigrant, he couldn’t take the liberty of making political comments. He published a few drawings in L’Assiette au Beurre in 1901, and in November 1902, he made the exceptional issue of that same magazine which he called ‘Gens du Monde’ (‘People of the World’). 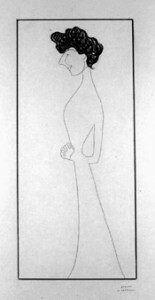 With those 22 drawings, he denounces the vices of the bourgeoisie, notably adultery, the futility of women and money. He became interested in the Humbert case. At the end of the century, caricaturing developed strongly. Not only are there countless new satirical newspapers, but caricatures are no longer reserved to newspapers and albums, they are starting to invade walls and fences. Cappiello’s first posters date back to 1899. 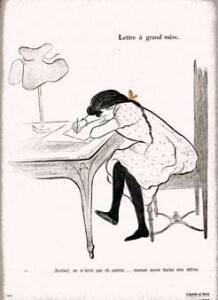 He will start dedicating more and more time to poster art and abandon press cartoons in 1905. 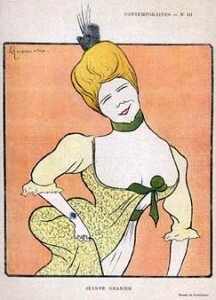 His caricatures can now only be found on posters, except for during the Great War. 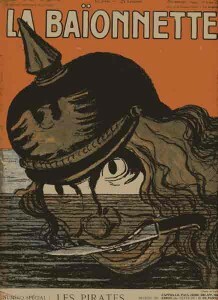 His dislike for the enemy incites him to publish numerous anti-Germanic press cartoons in La Baïonnette from 1915 to 1917.The style of his drawings changes completely and becomes aggressive. Which is very unlike Cappiello’s character which was rather restrained. During his entire poster artist career he will conserve his talents as a caricaturist. Cappiello’s stripped caricaturing style is particularly well-suited to poster art. Indeed, when a passerby has a glance at a caricature-poster, his brain must immediately recognize the person it represents and be attracted by a few pleasant details; for example a position, or a smile, a particular feature of the person’s face which is well emphasized. Only then will he or she become interested in the text surrounding it. He will draw posters for many artists such as: Hélène Chauvin, Odette Dulac, Réjane, Louise Balhy, Gyp, Monna Delza, Polaire, Cora Brown-Potter, France Maillane, Sacha Guitry, Mistinguett, Jane Renouardt, Conchita Supervia and many others. 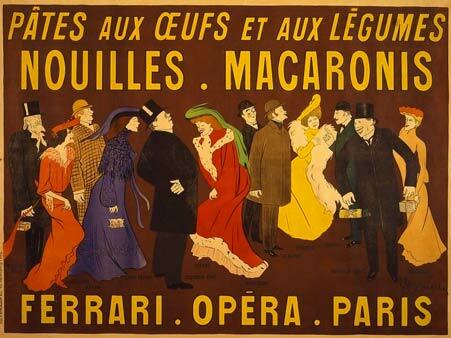 But we’re going to focus on one poster in particular, the one for Nouilles – Macaronis FERRARI which depicts numerous ‘show business’ actors of the time (1903). We recognize from left to right: Mounet Sully, Eve Lavallière, Coquelin Ainé, Réjane, Albert Brasseur, Charles Le Bargy, Jeanne Granier, Lucien Guitry, Coquelin Cadet and Marthe Brandès. Of course these actors had nothing to do with FERRARI pasta, but it was extremely daring in the 1900s to associate very famous artists to a food product. Nowadays it is common practice in advertizing but at the time, it really was a first. If you want to see other caricatures by Cappiello, go to the page ‘Links’, in the rubric ‘Online museums’ and click on the link for the Musée du Louvre.